NORDEN’s tanker vessels are continuously vetted by customers. Vettings are risk assessments conducted by oil companies, which focus on the safe and environmental operation of their chartered vessels. NORDEN's vetting target is to have the average number of vetting observations below the peer group benchmark, as indicated by the Tanker Safety Forum’s Benchmark (end October 2015), which was 3.92 in 2015. NORDEN had a total of 4.20 observations, which is slightly above the target. The SIRE (Ship Inspection Report Program) inspection performance increased from 3.87 observations per inspection in 2014 to 4.20 in 2015. The increase was mainly due to a few inspection outliners caused by challenging inspection circumstances. The majority of inspection went as expected with a good result. The internal SIRE inspection target for 2016 will again be set low to ensure that the vetting performance and focus are maintained. There were no direct SIRE rejections in 2015, but some oil major screenings resulted in rejections requiring new SIRE inspections as verification. The high focus and detailed inspection preparations by the crews and office were maintained in 2015 and will continue in 2016. Tanker Management Self Assessment office reviews were conducted in 2015 by Oil Majors, which resulted in new time charter business for NORDEN. NORDEN’s target is to have PSC inspection deficiencies below the peer group benchmark average of 1.1 deficiencies as measured by Boston Consulting Group in 2015. NORDEN had an average of 1.02 deficiencies per PSC inspection per owned vessel technically managed by NORDEN in 2015, resulting in NORDEN meeting its target for 2015. NORDEN experienced 1 PSC detention out of 106 Port State Control inspections in 2015. In Baltimore, US, NORD-ENERGY (IMO No. 9314090) was detained on 31 January 2015 for 3 days due to incorrect Oily Water Separator operation. NORDEN will continue to focus on safe operation and high maintenance standards of the vessels to avoid similar situations in the future. The crew and office continuously follow up on the implementation of the corrective and preventive actions on the raised PSC deficiencies to ensure our PSC performance and target are met. NORDEN has participated in Flag State meetings regarding PSC challenges around the world during the course of the year. Flag State attendance was arranged on a maiden voyage in the Far East to assist the Master and crew in a known challenging PSC port. In 2015, NORDEN experienced 2 minor environmental incidents where oil leaked outside containment into the surrounding water. 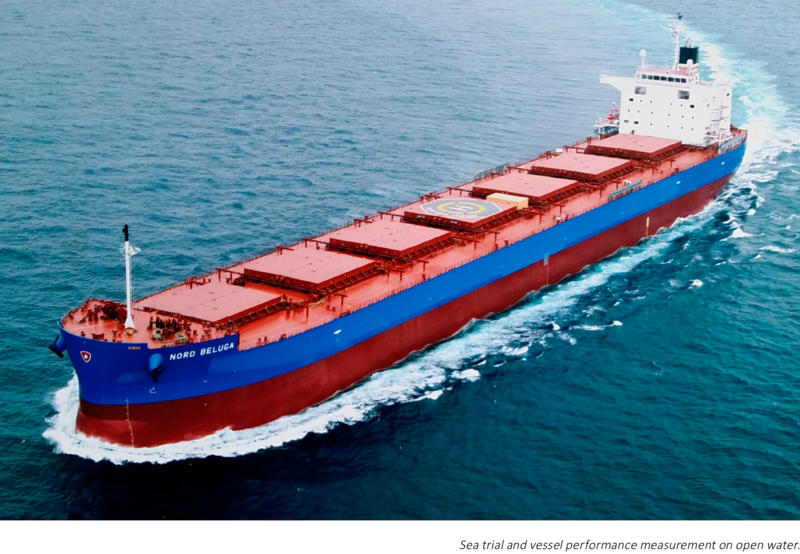 On a dry cargo vessel at Port Alfred, Canada, oil was spilled on deck during disconnection of a bunker hose following bunker operation, as the hose had not been properly drained. Approximately 40 liters of oil was spilled on deck and 10 liters of oil went through an untightened scupper plug and onto the ice. The spilled oil was removed on the ice by shore assistance. On a tanker vessel at anchorage off the Canadian coast, a minor volume of hydraulic oil entered the sea due to an oil leakage from the steering gear unit. The hydraulic oil leaked down the rudder stock of the steering gear unit and into the water. A slight oil sheen was noted on the water and the spill was reported to the respective authorities. The leakage was stopped and no further actions required. In both cases, the incidents were handled in accordance with NORDEN’s Safety Management System procedures and the local authorities were notified of the incident. There have been no other spill incidents affecting the surrounding environment. NORDEN takes all possible measures to avoid these types of incidents during the daily operation of the vessels. Several times per year, crew members receive training in contingency exercises. In the event of an incident, mitigation material – such as pollution prevention equipment – can be found on board, and the crew is trained in using it. Table top oil contingency drills are performed on both dry cargo vessels and tankers in the office on a yearly basis. 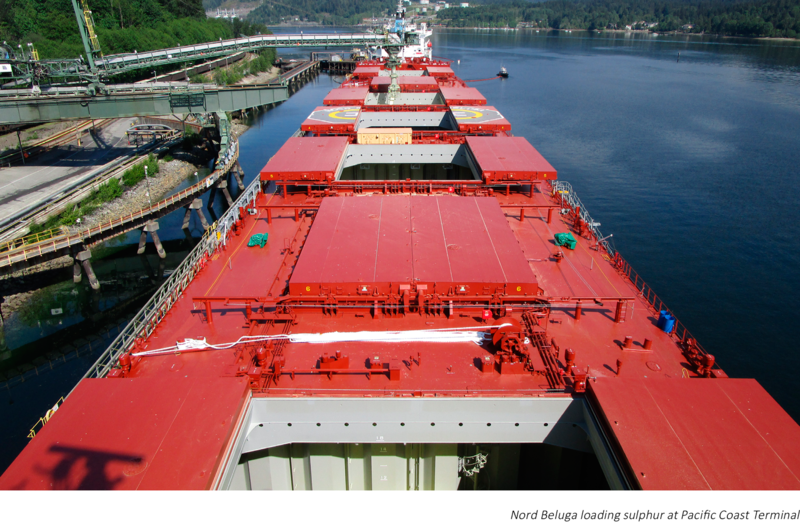 Moreover, due to poor communication, one of NORDEN’s owned vessels in external technical management, experienced an unintended incident concerning the use of high sulphur fuel in Glomfjord Port, Norway. As soon as the mistake was noticed, it was rectified. NORDEN continues to follow protective measures in accordance with the BMP4 standard (Best Management Practices to Deter Piracy off the Coast of Somalia and in Arabian Sea Area, Version 4 August 2011 (amended 1 December 2015)), which has been developed by the international shipping industry in collaboration with military organisations and supported among others by NATO, EUNAVFOR, IMB, INTERTANKO, ICS, OCIMF and BIMCO. NORDEN still abide by the same principles when it comes to anti-piracy measures: They are to avoid, detect and delay pirate attacks. In 2015, there have been no piracy attempts on NORDEN’s owned vessels. NORDEN has also renewed the 1-year permission from the Danish Ministry of Justice allowing the use of armed security guards on board Danish flagged vessels. On both Danish and Singaporean flagged vessels, NORDEN will continue to assess the necessity of using armed guards on a case-by-case basis using individual risk assessments. The piracy trend seen in 2014 continued in 2015. There has been a further decrease in piracy activity off the coast of Somalia and in the Gulf of Aden, while hijackings for cargo theft and attacks off the coast of West Africa when sailing in the Gulf of Guinea remain the main concern. In South East Asia, hijackings for cargo theft and simple robberies continue to be of concern. NORDEN experienced 1 attempted armed robbery and 3 cases of theft in 2015. The attempted armed robbery took place in Indonesia with no crew injured and nothing stolen. Of the 3 cases of theft, 1 took place in Malaysia, 1 in Nigeria and the last 1 in Vietnam. In all 3 cases, only minor items were stolen. Overall, the number of piracy attacks has dropped due to a combination of factors, including increased military action, preventive measures and increased use of armed guards on board ships off the coast of Somalia and in the Gulf of Aden. However, it is crucial that these combined efforts continue, as any change or complacency could rekindle pirate activity.